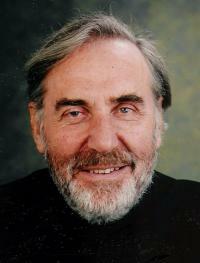 Charles G. Ofiesh, 85, of St. George Orthodox Church in Altoona, PA fell asleep in the Lord Monday, August 23, 2010. Charlie was a long time member of The Order of St. Ignatius and served many years on the parish council as a member and chair. He initiated an Endowment Fund and worked tirelessly for the good of the parish. 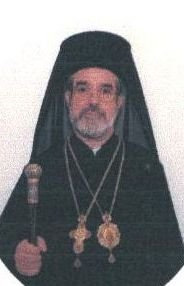 In 2005 he was awarded the Antonian Silver Medal by Metropolitan Philip. He was for most of his life in the parish, “always there.” He will be greatly missed. His leadership in the parish, in Altoona and in Pennsylvania is established by the list of organizations and accomplishments of his life as well as his three children, three grand-children and six great grandchildren. 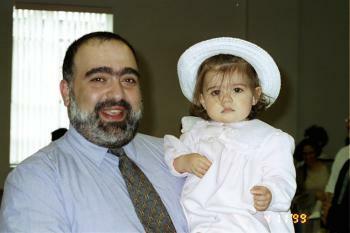 He was born in Albany, N.Y., son of George and Emily (Ofiesh) Ofiesh. He married Helen V. Ajay on Sept. 4, 1949, and she preceded him in death on May 14, 2009. Charles was a 1942 graduate of Altoona High School. He was a U.S. Army veteran of WWII, serving in the Pacific theater, and the Korean conflict. He retired as a Command Sergeant Major after serving 41 years in the Pennsylvania Army Reserve. He received 26 awards and decorations, including the Legion of Merit and the Meritorious Service medals. He retired as a general contractor and owner of Ofiesh Construction. Charles was a member of the Altoona Zoning Board for more than 45 years, past president and life director of the Pennsylvania Builders Association, past commander of the local and Pennsylvania Disabled American Veterans, past commander of the American Legion, life member of the VFW, life member of Cooties and parade marshal in Altoona for more than 30 years. Notice has been received this morning from the Patriarchal Office in Damascus of the falling asleep in Christ of His Grace Bishop Dimitri Ilyan Al-Hosni following a long illness. As a priest His Grace had served at the Patriarchate in Damascus and as a bishop in Rio de Janeiro, Brazil. Prayers are requested for Salem Ghareeb, who recently reposed at age 90. He is survived by his wife Nabiha Ghareeb and children, Issam (Carol), Michel (Gail), Nouhad (Fr. George) Shalhoub, George (Nabelah) and Elias, ten grandchildren, twelve great grandchildren, and many nieces and nephews. Salem’s greatest virtue was his strong faith in Christ and His Holy Church. He was a great father and a wonderful and loving grandfather. He was the living patriarch of the Ghareeb family. A life time member of St. George Cathedral, Salem was a great painter, enjoyed gardening, reading and woodworking. Salem will lie-in-state at St. George Cathedral, 3754 Woodley Rd. in Toledo on Thursday, August 12th from 5-8pm. The Trisaigion Prayer Service will begin at 8pm. On Friday, August 13th, Salem will lie-in-state at St. George Cathedral from 10-11am. The Funeral Liturgy will begin at 11am. 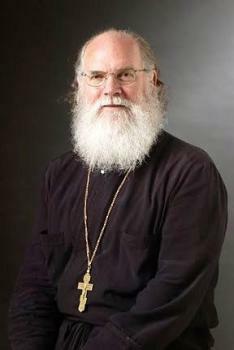 Your prayers are requested for the repose of the soul of Archpriest Matthew MacKay, 54, proistamenos of St. Joseph Church in Houston, TX, Dean of East Texas and member of the Diocese of Wichita and Mid-America Council of Presbyters, who fell asleep in Christ yesterday morning, July 26th. Fr. Matthew is survived by his wife Khouriya Lynn and their sons Patrick and Sean. It was with great shock and with sadness that I heard of the passing of Fr. Matthew. Fr. Matthew and I have been good friends since he was assigned to St. Joseph’s. For a good period of time, he heard my confession. He shared the altar with me at St. Joseph’s for many Fridays during Great Lent as we celebrated the Liturgy of the Presanctified Gifts. We renewed this practice during this past Great Lenten period when I visited Houston and once again celebrated the Presanctified Liturgy with him on Friday morning. Fr. Matthew was a priest who loved the holy Orthodox Church with his whole body and his whole soul. He celebrated the divine services diligently and with great joy. He loved God, and he loved the parishioners God gave him to minister to. I can remember many times when we visited together he talked about the concern that he had for the salvation of the parishioners of St. Joseph. He was a man of great courage. He was not afraid to speak the truth, even if it meant that he would personally suffer because of it. The most important thing to him was that he did what God wanted him to do. In my humble opinion, he ministered faithfully and diligently, always seeking to do God’s will. Update: His Grace Bishop ANTOUN attended the firefighters' memorial on Friday, July 30. An estimated 8,000 firefighters attended the service. As many as 10,000 firefighters from across the nation and Canada are expected to attend funeral services for Lt. Steven Velasquez, 40, and firefighter Michel Baik, 49, who died while battling a house fire on Saturday. Firefighter Michel Baik was a lifelong member of St. Nicholas Church in Bridgeport, CT. He lost his life fighting a house fire on Saturday, July 24. The wake will be Thursday, July 29, at the Abriola Parkview Funeral Home, 419 White Plains Rd., Trumbull CT, from 4-8 PM. The funeral service will take place at St. Nicholas Church on Friday, July 30, beginning at 2 PM, followed by the internment. The mercy meal will follow within the facilities of St. Catherine of Sienna Church, 220 Shelton Rd., Trumbull CT.
Because a very large turnout is expected, there will be additional seating in the church hall with an audio/video feed of the funeral service for those who cannot get a seat in the church. V. Rev. Michael HarperThe Christian world lost one of its most dedicated statesmen earlier this year. The V. Rev. Fr. Michael Harper departed this life on January 6, 2010, at age 78, in Cambridge, outside of London, England. He was an archpriest under the Patriarchate of Antioch. Fr. Harper was baptized into Christ in the Church of England, and served for 40 years as a celebrated Anglican priest, emerging as an international leader of the spiritual renewal movement in that communion. Converting to the Orthodox Christian Faith in 1995, he carefully maintained his Christian friendships within the Anglican Church. At the recommendation of Metropolitan PHILIP, Patriarch IGNATIUS IV personally guided Fr. Michael and his wife, Jeanne, through the transition into the Orthodox Church, appointing him to lead the Antiochian deanery in the British Isles. He left behind twenty convert parishes there as well as a ground-breaking Orthodox Studies program at prestigious Cambridge University, his alma mater. Significantly, Fr. Michael established the first-ever all-English Orthodox parish in London. He was one of the most authentic and deeply committed Christian men I have ever known. Fr. Antony served as pastor at St. George Church in Indianapolis, IN in 1982, and he served a number of parishes prior. He has been living in retirement as a member of this parish ever since. A vigil for Fr. 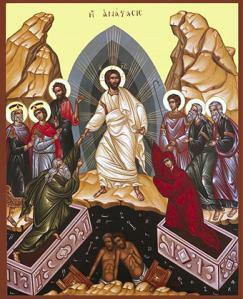 Antony will begin with Psalm readings at 5 p.m. Tuesday, April 20, at St. George Church, and a prayer service beginning at 7 p.m. Divine Liturgy will be served at 10 a.m. Wednesday, April 21, and will proceed directly into the funeral service (at about 11 a.m.). Interment will follow at Oaklawn Cemetery, and the mercy meal will be a pitch-in at the church thereafter. We express our sincere sympathies to Khouriya Patty Beauchamp, to sons Michael and Christopher and to all their families. The family requests that memorial donations be given in place of flowers to St. George Orthodox Church of Indianapolis, the Apple Patch Foundation of Kentucky or the Shriners Children’s Hospital. George Ansara fell asleep in the Lord on Wednesday, April 14, 2010 at the age of 82. Mr. Ansara will lie-in-state at the Antiochian Orthodox Basilica of St. Mary, located at 18100 Merriman, Livonia, Michigan on Friday, April 16th from 5:00-8:00 p.m. Trisagion prayer service begins at 8 p.m. On Saturday, April 17th, Mr. Ansara will lie-in state at the Basilica from 10:00-11:00 a.m. The Funeral Liturgy begins at 11:00 a.m. followed by a private burial. George Ansara migrated from Aita El-Fokhar, Lebanon. He was married to the late Geraldine Ansara. With his brother Andrew, they became the largest franchise owners of the Big Boy Restaurants. An entrepreneur who also brought the Red Robin Restaurants to our state, he employed thousands of people. He started the mission of St. Mary in Livonia in 1972 with a handful of parishioners and lived to see the Basilica built to reflect what he admired most – his family, his faith and his work. George's greatest passion was that in order for family and community to survive, they must have a place to worship. George was a great dad to Lewis Ansara and Denise (Shaheen) Boumaroun, and the late Debra Ansara. He was blessed with his brother Andrew Ansara, his sisters Marie Ansara, Violette Matta and Nazik Kehdy, He was the loving grandfather of Joe, Mac, Lauren, Deanna, George, Lewis and Daniel. He is survived by many nieces and nephews. In lieu of flowers, the family requests donations made to the Basilica of St. Mary Building Fund. Please leave the family condolences and cherished memories at harryjwillfuneralhome.com. May his memory be eternal! Mrs. Jean Miriam Card Walker, 100, died on March 1, 2010, at the Little Flower Assisted Living Community in Charlotte, NC. Mrs. Walker was born in Dora, AL, on April 15, 1909, and lived in Palmerdale, Alabama, for 50 years before moving to Charlotte in 1986. She is survived by two sons, Fr. Gordon Thomas Walker, Sr. (Mary Sue) founding priest and pastor emeritus of St. Ignatius Church in Franklin, TN; and Phillip Jackson Walker of Charlotte; a daughter, Mary Exa Walker Crew (Steve) of Charlotte; and numerous grand-,great-, and great-great grandchildren, nieces, and nephews. Mrs. Walker was preceded in death by her loving husband of 50 years, G. T. Walker, Jr.; a daughter, Alice Jean Walker; and a son, David Richard Walker, Sr. (Carol). Jean personally cared for Alice, a loving special needs child, for over 60 years. Jean and G. T. were charter members of First Baptist Church of Palmerdale, where Jean sang in the choir, taught Sunday school, and served in many other capacities. She later taught the Sonshine special needs Sunday school class at Briar Creek Road Baptist Church in Charlotte. Jean’s life was marked by service and quiet giving to those in need. A service of Christian burial will be held on Saturday, March 6, at 10 AM at Roebuck Chapel, 9012 Parkway East, Birmingham, AL, 35206, the Rev. B. J. Strickland of Huntsville officiating. The family will receive friends from 4:30-8 PM on Friday, March 5, at Roebuck Chapel. Younger family members will serve as pall bearers. Memorials may be made to the First Baptist Church of Palmerdale, AL, 35123.